It shows me some characters, but not a waveform, like line after line, related to the adjusted value. Please post code using the "<>" in the menu above! Here you use a comparison symbol "=="
"y==y--;" should be just "y--;"
I'm very confused. 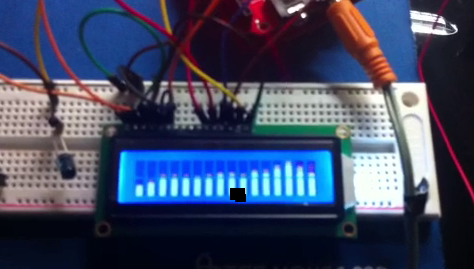 Tell [much] more about this eight-row LCD. Is it some kind of bargraph segment module? Character LCD? Some type of graphic display? Are you trying to do something like this on a character LCD? Or on a graphics LCD? If not, describe, or give a picture. How do you put 102 values onto 8 rows? Yes! That is exactly what I am trying to do, the first and the second pictures! How do you put 102 values onto 8 rows? I devided 102/8 =12.75, since i work with int, I started with 13 first, which is a little bit more. How many characters on your display? Rows and columns. The short answer is that you can do something like picture 1 or 2. 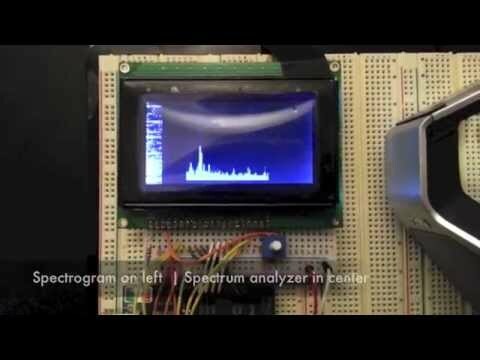 But not the character-LCD equivalent of the "waveform" display as in the graphic LCD in picture 3. Why? There are only 8 defineable characters, so you cannot have a different value in each "bit position" across the display. I still don't understand about the "102". Are you trying to put five different values in e.g. column 1, then five different values in column 2, etc? You won't be able to in the general case, as there are only eight user-definable characters. You have not given us much to go on. No picture or diagram or ASCII-art of what you want to do. 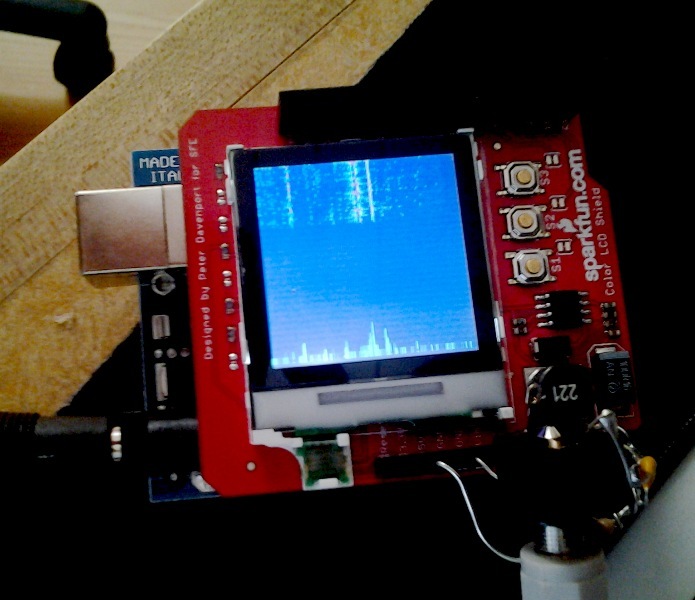 And the mystery function write_lcd_one_step(). But 10+ years later, there are a lot of more modern graphics displays to choose from. cat -with your mouse- and paste existing green code. I can generate a 'pi' sign using this code, but i think that this comes from my cgram. If i adjust the values from my adc, the sign gets faded. If you want me to pay further attention, show a picture or diagram of what you want to end up with. And for now, eliminate the "for loop" and use some constant test data. Without that, I still think you are dealing with the 8-character maximum. Tell more about what "fading" means. thanks for your help. I solved the problem. Is there anything I need to do for this regarding these posts/topic? Is there anything I need to do for this regarding these posts/topic? For the benefit of future readers, describe how, exactly, you "solved the problem". If one (or more) of the replies gave the answer to your question, use the 'Mark Solution' button to identify it/them. So, if you feel multiple posts have all contributes to the solution, you can write a summary post and select the 'Mark Solution' button for that one. Note that marking the solution does also flag it in the topic lists; so there is no need to also edit the thread title with "Solved", or suchlike. Added illustration of the "solved" marker. So, if you later decide the the issue is not actually solved, you can change your mind. Note also that marking a solution does not prevent further posts to the topic. Now I don't know what "bin_number" is in this or what value it may hold but I cannot help thinking this code is going to be writing to at least 13 locations of an array that has only allocated 8 bytes! Are you sure, Micro Gyro? He already solved his problem. That's another good reason for sharing the "solution" here - it can be reviewed! Post 10 writes into a 8 bytes array (set is upper bounded by 8; unless adc grows 12... 16 bits; in 1rst loop, array index is < 8 (in 2nd loop , too) . Here is the code that solved my problem on displaying a waveform on an char lcd proportional to the input voltage coming from my adc. /* i is not initialized ? did your compiler warn you? I still have a problem reading my present adc-value into an array. But i think that this does not put my data into the array "volt_array" 100 times and overwrites the values each time it counts up again. variables shared between main() and ISR() must be declared volatile. and if larger then 8 bit, then read atomically as well. And volt_array is too small. PLEASE, when you have a problem with actual code do not post code that you just typed in. Copy the malfunctioning code from your editor into a forum post. It is essential that we see the actual code that you have, not some inexact replication of it. Your computer has copy/paste-functionality. Use it. There is a missing semicolon at the definition of volt_array. main() has a declared return type of int, yet no return statement is present. Also, there is no actual loop in your main() so execution will just rush though it once. we can repeat your symptoms by using the code you posted without any alterations at all. Honestly, I cant make heads or tails of " this does not put my data into the array "volt_array" 100 times and overwrites the values each time it counts up again". Tell us exactly what you want your program to do. Tell us exactly what you observe your program doing. copying into voltArray[newCount] should be atomic, too (is longer than 8 octets; by unluck, you might copy half before being interrupted, leading to weird, hard to reproduce, inconsistencies). You mean "8 bits", not "8 octets" right? Atomicity issues is not only about accessing larger-tha-byte values. Even for byte-sized values there might be problems if two independent "threads of execution" accesses such a value. the variable x has the value 42. It reads from the location x into a register, that now holds the value 42. It adds 7 to that register, so that it now holds the value 49. By some mechanism (e.g. an interrupt) now thread B starts its operation on x. It reads from location x into some register, that now holds the value 42. It multiplies it by 2, so that it holds 84. It stores that value back to the location x.
Thread B now relinquishes control. Thread A commences Remember, it has the value 49 in "its" register. Thread A stores the value 49 at position x. We end up with the update from thread B being overwritten/lost. Making both accesses atomic means forcing them to execute in sequence rather than interleaved. The common technique is to disable interrupts while accessing data. In ISRs interrupts are disabled automagically, so unless you've enabled interrupts explicitly in the ISR there's nothing special to do there. In other code you could use CLI/SEI explicitly, or (better, if avr-gcc/avrlibc is used) the macros from atomic.h . Well, I agree I was wrong : (and OPs way of writing is complicated , as there is a function call . If he wants to get results at a regular time rate, this getAdc call might be , in a simplified form, put into the interrupt (if rate is too high, whether AD conversion is in the inetrrupt or not does not matter).